Why another blog about Beer! I wanted to go to Verdun to visit the World War I battle fields. They were pretty impressive. Verdun is also in the middle of the Champagne region. Pam and I had more than one glass of wine that weekend and enjoyed the K-Bar, a champagne bar in Verdun. So why am I blogging about beer during a visit to champagne country? Well, as we were walking around Verdun Saturday night we ran across a very nice little brew pub. Not only did they brew their own beer, but they also had beers from around Europe. It was a good chance to stock up on some of my favorite Belgian beers. L’Estaminet has two entrances, we initially entered into the brewery/beer store side. Around the corner, the bar entrance is at, 45, Rue Des Rouyers. I did not catch the Brewmaster’s name, but he was a very nice guy. They also had a whole wall of glassware from different breweries…including Budweiser…the US Bud, not the Czech version. I was able to purchase a few more bottles of Kwak, which I very much enjoy, as well as a .75L of ﻿﻿L’Estaminet’s Christmas beer, which I am drinking right now and is a nice Amber beer. I also had a beer at the Bar and found their beer to be a typical Lager beer, nothing really special. While he spoke very little English or German, and I speak very little French, we were able to communicate at some level. He was definitely pleased with my beer purchases. If you are in the Champagne region of France, I definitely recommend visiting the Verdun Battle Fields and to check out this quirky little beer store. Had you asked me 6 months ago, I would have told you that Allgäuer bier was my favorite beer. I love Allgäuer bier. Allgäuer has two distinct breweries, Altenmuenster and Brauhaus. I have never had any of the beers from the Brauhaus. Based on their website (http://www.allgaeuer-brauhaus.de/), I am assuming the Brauhaus beers are more commercial. There must be 15 to twenty different varieties. There are only 5 varieties of the Altenmeunster beers, this does not mean that the others are bad, it really just means that I have not had the opportunity to try the others. Of the Altenmeunster beers, I have had 3 of 5. One is a Hefe Weissbier. I do not enjoy Weissbier so much and have not tried this one. The other beer I have not tried is their Maibock. I love Maibock beers, but have not seen it at my local beer distributor. The other biers are very nice, one is a Urig Wurzig, hopfig herb and their Winterbeir. The Urig Wurzig and the Hobfig Herb are very nice beers. I really enjoy the Urig Wurzig, it is very tasty and flavorful. It is a bit sweet with a nice hops flavor to it. The Hopfig Herb, has more of an earthy, herbal, flavor to it and it is my least favorite of the three I have tasted. My favorite it the Winterbeir. I have been disappointed so far this year as it has not made an appearance at my local beer distributor so far. It is a dark beer and it is quite flavorful. If I remember correctly from last year, the flavor is more of a malty flavor. I may have to take a road trip to buy a case of the winter beer. If you find yourself wandering the beautiful back roads of Bavaria, you may want to wander over to Markoberdorf and explore the town and enjoy the brewery. Maredsous is an Abbey based brewer. The last trip into Belgium, I purchased two 4 packs, one of the Brown and one of the Triple. The Triple is an Amber beer at 10% Alcohol and the Brown, is a brown beer at 8%. The last beer I spoke about was Leffe, which was a large brewery beer. 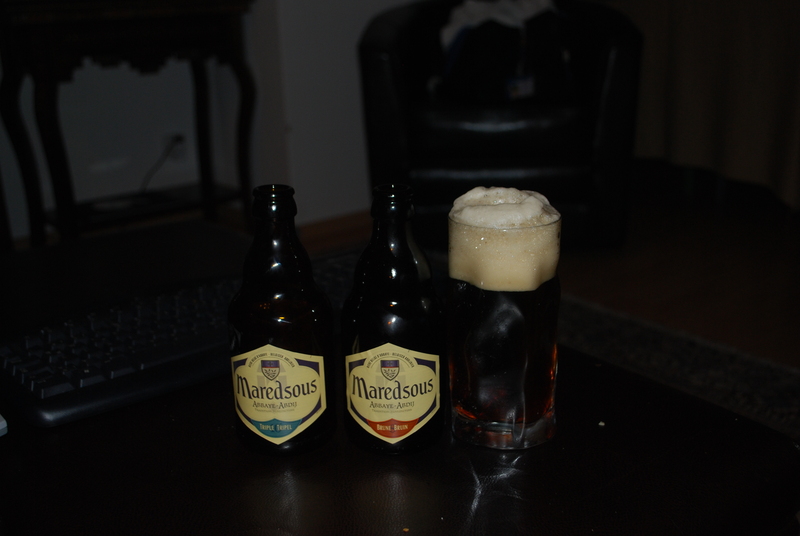 I would not say Maredsous is a small brewer, but it is not anyway near the size of an Leffe. The brown, is very nice. It has a mellow malty flavor which lends it a nice nutty flavor. On the other hand, the Triple has a more hoppy flavor whihc lends it a more shall we say, smoky flavor. Both are very nice beers, but I would say they higher alcohol of the triple makes it a little less easy to drink. I am sitting here drinking a Leffe Brune. That would be a dark beer, about the color of coffee. I am trying to think of words to describe this beer. Let me start by say that it is 6.5% alcohol. It is also brewed by Inbev. Inbev is the largest brewer of Beer in the world. They own a plethora of beer brands all over the world and in fact they do own Anheuser-Busch or should I say, they own a controlling interest in Anheuser-Busch, which is similar to the rumors of a Python swallowing a Crocodile whole. There is always a chance the Python could die also. Let me just say that Leffe is not a bad beer. Let me also say that Leffe is not a good beer. It is a beer. For the color of beer, it is a fairly light beer. It does not have a strong taste and I would say that it is brewed not to be a specialty beer, but to be a mass appeal beer. This does not make it inherently bad, but it does not make it a good beer either. So, in the US I am at time faced with this question, Bud, Miller, Miller Lite or Coors…I will drink water. If Leffe were available, I would drink Leffe. My introduction to Belgian beers began when my Brother-In-Law, Evan, started as the Head Chef at the Belgian Cafe when it opened two days after I was married to his sister. Belgium has a some fairly specific beer legislation and there are approximately 10 different beer varieties. As an example, one variety is Abbey and Trappist Ales. There are only 7 Trappist monasteries in the world that brew beer and 6 of them are in Belgium and only these six breweries are able to brew Abbey and Trappist Ales. When drinking most other beers, you can drink from any type of glass or straight from the bottle (Canned beer is just bad form aside from a very few exceptions). Belgian beers are bit more finicky. They don’t just want to be poured, but they should be poured into the correct glass. In a Belgian beer store, you can buy the beer and you can buy the glass to pour the beer into. As mentioned in the title, I am going to talk about Kwak. 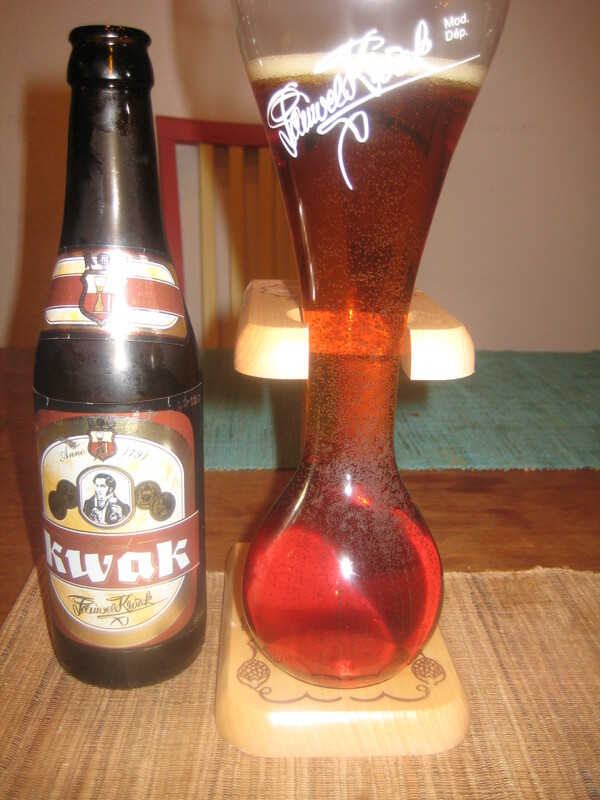 Kwak is an amber Belgian beer that has 8.4% alcohol content. Kwak has a nice smooth flavor. and has a sweet, nutty flavor that I quite enjoy. Aside from the flavor, Kwak also has a very cool glass. Having spent time at The Dickens Inn during my misspent youth, I am familiar with the form of an English Yard is. The Kwak glass is like a small English Yard (33 cl). Kwak is brewed by Brewery Bosteels, who brew several different beers and which has been owned by the Bosteels family for 7 generations. I have also had the pleasure of tasting their Triple Karmeliet, but that is a story for a different day. I love to travel. Every place has something special. Vienna is music, Rome is history, Spain is Tapas, Israel is houmas. I moved to Germany. Germany is actually a country steeped in culinary goodness. Wurst, schnitzel and yes, even Beer. Even before moving to Germany, I had become a bit of a beer snob. I had the misfortune of coming of age at a time when the three big brewers, Budweiser, Miller and Heileman, dominated the US beer market with beer that I feel was unimaginative and brewed to be profitable to the mass consumer market. A certain amount of brewing a beer is art. It is a little science and a little art. The big three had removed much of the art and depended on science to deliver consistent results that their target audience could count every time they opened a new beer. This though meant that beer was boring and there was not a lot of variation. When I was a young child, even a city such as Philadelphia had several independent brewers. By the time of the 80’s there were no independent brewers. Then in the late 80’s due to a change in legislation, micro-brewers started selling their own beer. For a while, an individual was able to make a certain amount of beer for personal consumption. Some of these people inevitably would make and possibly sell the beer to their friends. After it became legal, to brew and sell in small batches, it became economically feasible for small batch brewers to market beer in their region. In Philadelphia, Dock Street opened as a micro-brewery and then as a brew pub. In Boston, Sam Adams also opened in a similar fashion. So after spending close to a decade drinking crappy beer, I was introduced to better beer. This is not to say that all of the people who drink Budweiser or Miller should not drink those beers. I will say that these beers are not craft brewed. Most of these beers are made using accelerators to speed fermentation process. The main accelerator is High Fructose Corn Syrup. My first real introduction to better beer began in 1984 when we moved to center city. Before then, I had been drinking nasty beer at college. Being a college student, I drank what I could. After moving into Center City Philadelphia, I learned about The Dickens Inn at 2nd and Lombard Sts. in Philadelphia. There they served 20 or so British Beers. British beers being having a better pedigree than anything brewed by Budweiser. Today, I travel with a distinct purpose in mind. I explore local beers where ever I am. I find good beer in places you would not expect and I look forward to telling you these stories.